Are you searching for State of Maryland Apostille Service?. 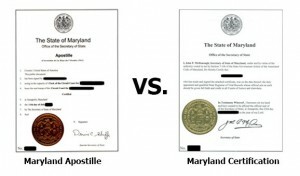 Are you not sure if you need State of Maryland Apostille or Certification?. Well, you have come to the right place as DC apostille. provides all available solutions to get your State of Maryland Apostille or Certification in the way that best suits your situation. You may choose to use our expedited State of Maryland Apostille Service, or, you can do it by yourself using our free Guide to Secretary of State Apostille. If you are living outside the State of Maryland or one of its major cities such as Annapolis, Baltimore, Columbia, Germantown, Silver Spring or Waldorf. If you are in a time-pressed situation to obtain your Apostille. If you have documents in Bulk. If you have business documents that need to be certified timely and effectively. If you are not sure about the eligibility of your document for the Apostille process and you want to use our free Document review service. If you need flexible payment options that suit your company. State of Maryland Apostille fee is $5.00 per Apostille or certification, Processing Time is One Buisness Day. Download the order form for State of Maryland Apostille here. All Vital records issued in the State of Maryland must have the seal and the signature of the issuing agency. The Vital Records does not need any notarization. **Northwest Street ends at Church Circle. **Go around Church Circle about 1/4 of the way to Duke of Gloucester Street and turn right. **From Main Street, bear right onto Francis Street. Hours are 8:30 a.m. 12:00 and 12:30 – 4:00 p.m. EST, Monday through Friday. **The office will be closed from 12:00 – 12:30 for lunch. *The legislative session begins on the 2nd Wednesday of January and continues for 90 days.